Contract Bridge is played on Friday afternoons at 1:00 p.m.
Beginner's Bridge can usually be arranged for Friday Mornings at 11:00 a.m. If you are new to the game, or need to refresh, Sharon will do her best to get you up and running. 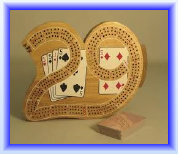 Cribbage is played on Thursday evenings at 7:00 p.m.
Friday Canasta is played on Friday Afternoons at 1:00 p.m. Enjoy this activity year round.